Firing up the grill this weekend? Make bruschetta (pronounced broo-SKEH-tuh). 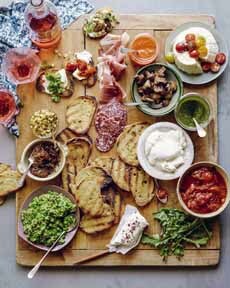 We love a DIY bruschetta bar. Just rub the bread with garlic, brush it with extra virgin olive oil, grill, and place the slices on a platter along with all the fixings. Even easier, brush the bread with garlic olive oil! You can buy it, or infuse your own in advance by dropping halved garlic cloves into a cup of olive oil (or however much you think you’ll need). Any leftover oil can go right into a vinaigrette. 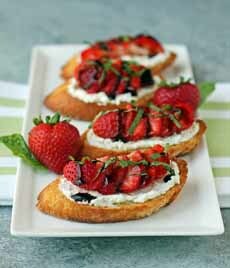 Plus, we have our own invention dessert bruschetta, below. The size of the bread slice. The cooking technique: grilling versus toasting. Bruschetta slices are larger, three or four inches in diameter) and grilled. Crostini, cut from a ficelle, a thinner baguette about two inches wide (the word is French for “string”). You can use bread of a different diameter; but if it isn’t grilled, it isn’t bruschetta. The verb bruscare is Roman dialect meaning “to roast over coals.” But there’s something simpler. Think of crostini as crust or crouton (which is its literal meaning). Toast has a crust. That’s how we taught ourself to recognize the difference. While Italians serve bruschetta as a snack, the smaller crostini can be served plain with soup and salad, like the original melba toast. Note that some American manufacturers and others in the food industry misuse the term, selling jars of “bruschetta.” To be accurate, it should be labeled bruschetta topping). Bruschetta is the grilled bread, not the topping. The simplest bruschetta topping is salt and pepper (i.e., seasoned garlic bread), but that’s for a bread basket. Almost any cheese, fruit, meat, spread or vegetable can be a topping. Toppings can be cooked, marinated, pickled, raw or smoked. For a DIY bar, offer at least three different toppings. We like everything, so tend to go overboard: Our toppings look like a buffet. 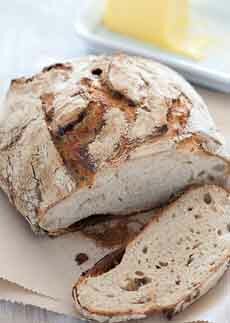 Regarding bread, we prefer a crusty sourdough or rustic loaf. Be sure the loaf will give you slices of a workable size. If you’re not familiar with the particular loaf, ask to ensure that it doesn’t have holes for the toppings to fall through. We have the loaves sliced at the store, then we cut the slices in half. Along with the bread, make sure you have fresh garlic and check your olive oil for freshness. Charcuterie: pâté, prosciutto, salume, etc. Raw and cooked veggies of choice: asparagus, grilled vegetables, sliced radishes, etc. More options: shredded mozzarella or other cheese such as thinly-sliced Brie, fish (we have a passion for anchovies and herring salad on bruschetta), other marinated vegetables, mostarda. We also like eggplant caponata, pesto and sautéed mushrooms, but tend to use them more in cooler weather. Who needs a burger? We’re heading for the bruschetta bar (photo courtesy What’s Gaby Cooking). 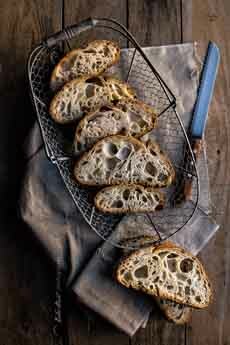 Buy bread that has a pretty solid crumb (photo courtesy The Stone Soup). This loaf is beautiful, but not for holding toppings (photo courtesy Bake Street). 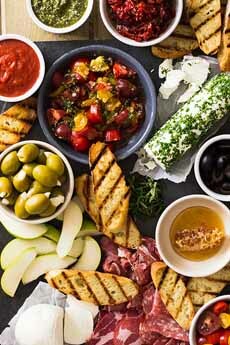 A bruschetta bar from Countryside Cravings. Dessert bruschetta, here with goat cheese (the recipe from Emily Bites). We use mascarpone. Most people won’t have seen dessert bruschetta. We don’t know if we invented it, but our sweet tooth gave us the idea years ago. Garnishes: chocolate chips, coconut, nuts, etc.